Sandy Bridge is launching with no less than 29 different SKUs today. That’s 15 for mobile and 14 for desktop. Jarred posted his full review of the mobile Core i7-2820QM, so check that out if you want the mobile perspective on all of this. By comparison, this time last year Intel announced 11 mobile Arrandale CPUs and 7 desktop parts. A year prior we got Lynnfield with 3 SKUs and Clarksfield with 3 as well. That Sandy Bridge is Intel’s biggest launch ever goes without saying. It’s also the most confusing. While Core i7 exclusively refers to processors with 4 or more cores (on the desktop at least), Core i5 can mean either 2 or 4 cores. Core i3 is reserved exclusively for dual-core parts. Intel promised that the marketing would all make sense one day. Here we are, two and a half years later, and the Core i-branding is no clearer. At the risk of upsetting all of Intel Global Marketing, perhaps we should return to just labeling these things with their clock speeds and core counts? After all, it’s what Apple does—and that’s a company that still refuses to put more than one button on its mice. Maybe it’s worth a try. Intel is referring to these chips as the 2nd generation Core processor family, despite three generations of processors carrying the Core architecture name before it (Conroe, Nehalem, and Westmere). The second generation is encapsulated in the model numbers for these chips. While all previous generation Core processors have three digit model numbers, Sandy Bridge CPUs have four digit models. The first digit in all cases is a 2, indicating that these are “2nd generation” chips and the remaining three are business as usual. 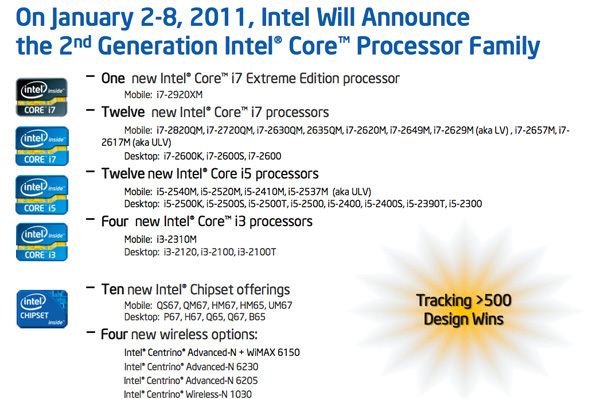 I’d expect that Ivy Bridge will swap out the 2 for a 3 next year. What you will see more of this time around are letter suffixes following the four digit model number. K means what it did last time: a fully multiplier unlocked part (similar to AMD’s Black Edition). The K-series SKUs are even more important this time around as some Sandy Bridge CPUs will ship fully locked, as in they cannot be overclocked at all (more on this later). There are also T and S series parts for desktop. These are mostly aimed at OEMs building small form factor or power optimized boxes. The S stands for “performance optimized lifestyle” and the T for “power optimized lifestyle”. In actual terms the Ses are lower clocked 65W parts while the Ts are lower clocked 35W or 45W parts. Intel hasn’t disclosed pricing on either of these lines but expect them to carry noticeable premiums over the standard chips. There’s nothing new about this approach; both AMD and Intel have done it for a little while now, it’s just more prevalent in Sandy Bridge than before. In the old days Intel would segment chips based on clock speed and cache size. Then Intel added core count and Hyper Threading to the list. Then hardware accelerated virtualization. With Sandy Bridge the matrix grows even bigger thanks to the on-die GPU. While almost all SNB parts support VT-x (the poor i3s are left out), only three support VT-d. Intel also uses AES-NI as a reason to force users away from the i3 and towards the i5. I’ll get into the difference in GPUs in a moment.